Wood is a very versatile material… it can be used for DIY home decor projects, crafts and even jewelry DIYs. It can be painted, stained or left unfinished. The possibilities are endless! Here are 50 of our favorite gorgeous projects made out of wood that will help you step up your style game. 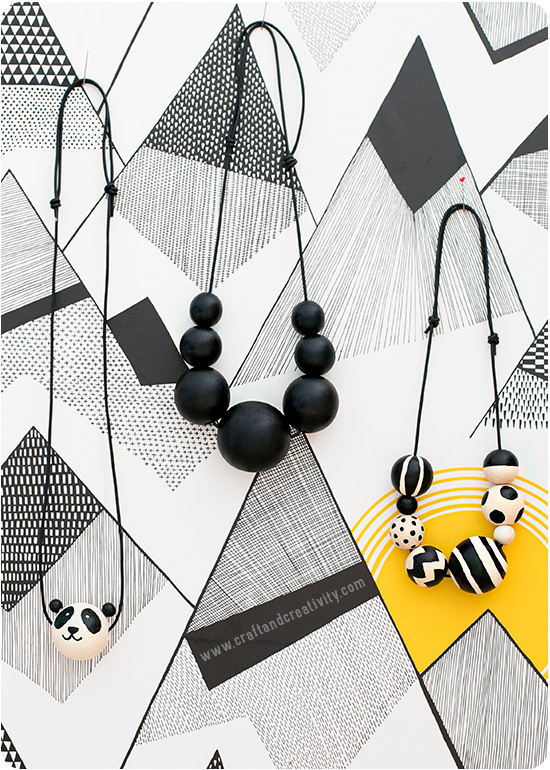 Dress up any old outfit with one of these stunning, whimsical wood bead necklaces. You’ll need some leather, wooden beads and paint in the colors of your choice. Make your way over to Craft and Creativity to find out exactly how to assemble your own pretty piece of wooden jewelry. 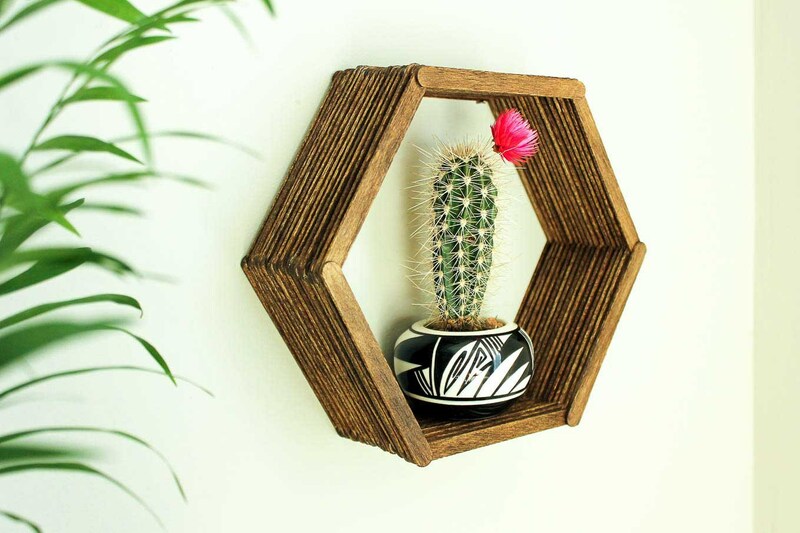 This wood triangle is mounted to the wall, and a regular terra cotta plant pot is inserted into a hole, creating a lovely wall-mounted plant holder. The use of raw wood gives it a natural, organic feel. Head over to The Merry Thought to find out how to make it. There’s no doubt about it – technology is taking over daily life, so it is refreshing to incorporate some natural materials into the daily grind. 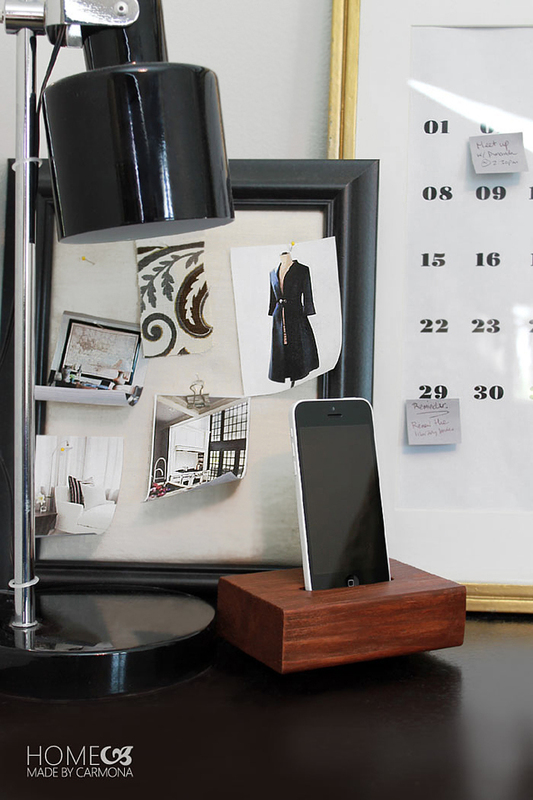 This beautiful wood charging station is easier to make than it looks. Check out the full tutorial for this DIY over at Homemade By Carmona. 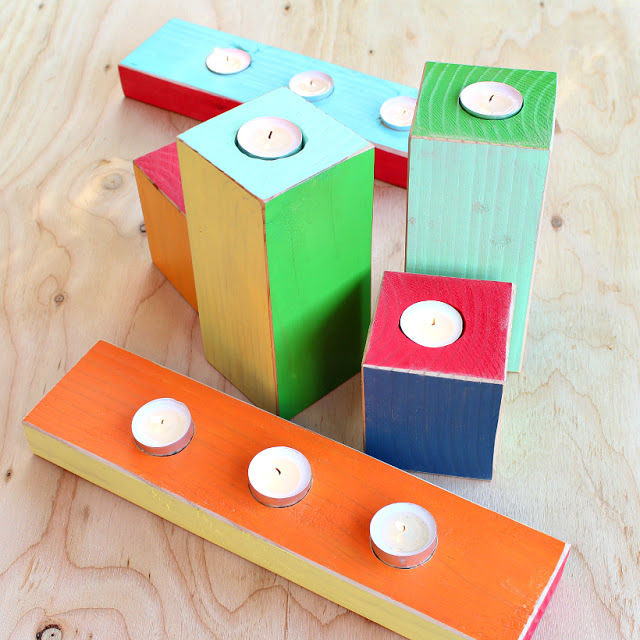 There’s nothing subtle about these brightly-colored wood block candle holders. Every side is a different color, making it the perfect project for all of you color-lovers out there. Make your way over to Mark Montano’s blog to find out how to make a few of these lovely pieces. 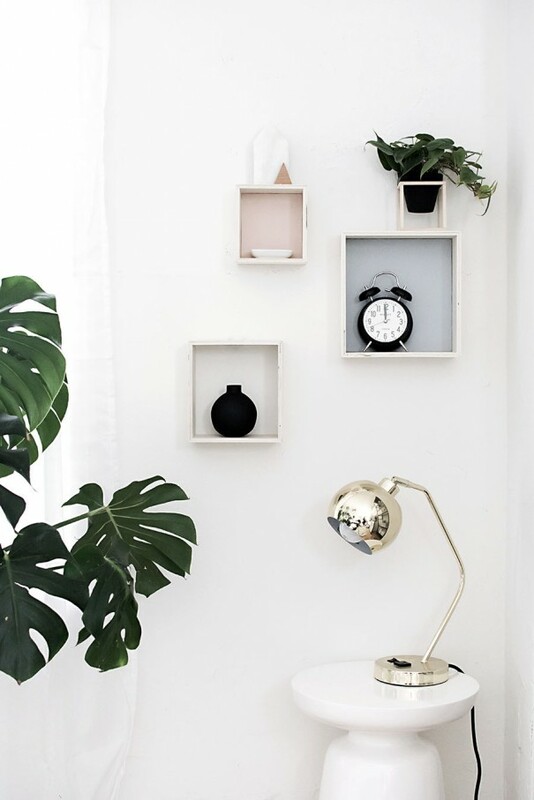 Elevate your walls with a set of these lovely wooden shadow boxes. They are perfect displaying decorative objects, plants or you can even just leave a few empty since they’re so pretty! Make your way over to Homey Oh My! to find out how to make your own set of wood shadow boxes. 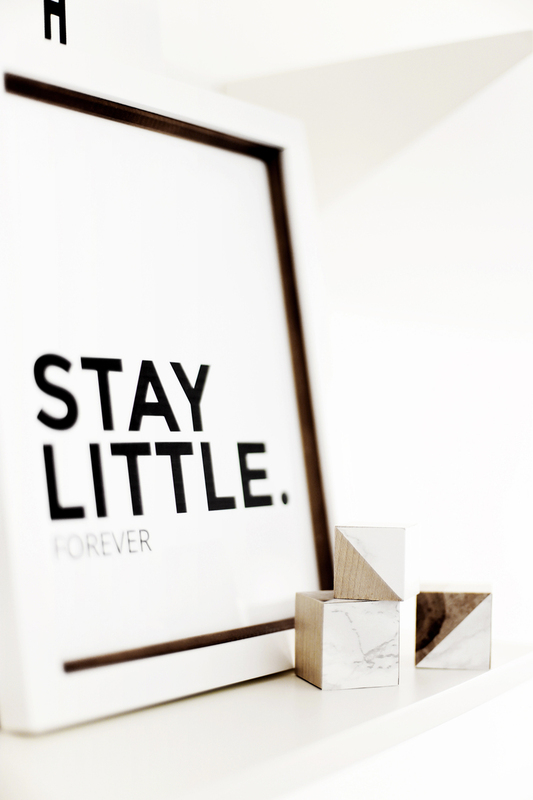 This is one of those super simple yet incredibly chic DIYs that I wish I had come up with! All you’ll need is a tall piece of wood, a handsaw, and a few other materials that you probably have on hand if you’re into woodworking. Check out the full tutorial over at BobVila.com, along with plenty of other photos. 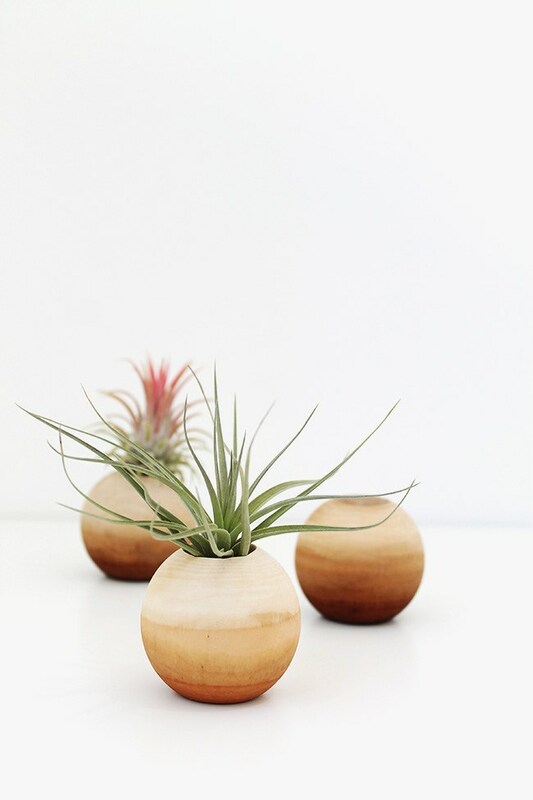 These round holders are a beautifully unique way to display air plants, and they’re quite simple to make. The key is to buy wooden doll heads (yes, wooden doll heads!) and then you can dye them your desired color. Make your way over to Almost Makes Perfect to find out how to make your own. 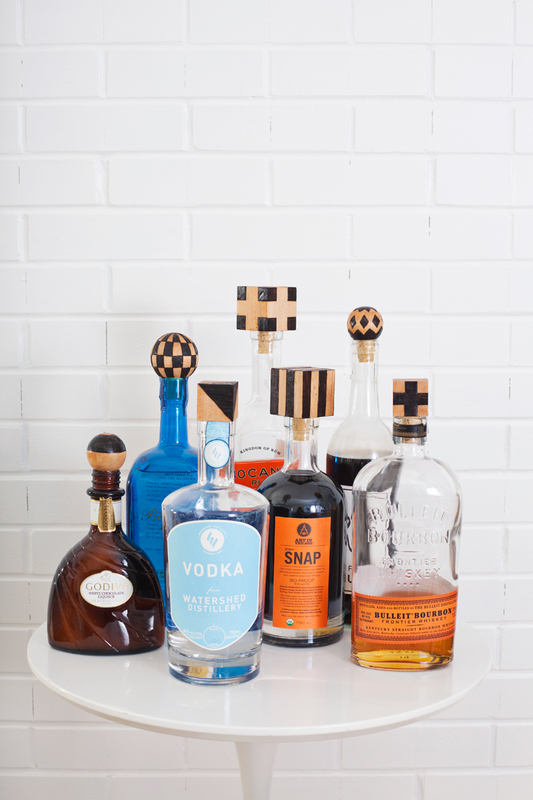 Close up your wine and spirits bottles in style with these fun wood burned bottles stoppers. You’ll need corks, wooden shapes and a wood burning tool. Make your way over to A Beautiful Mess to find out how to make them yourself. 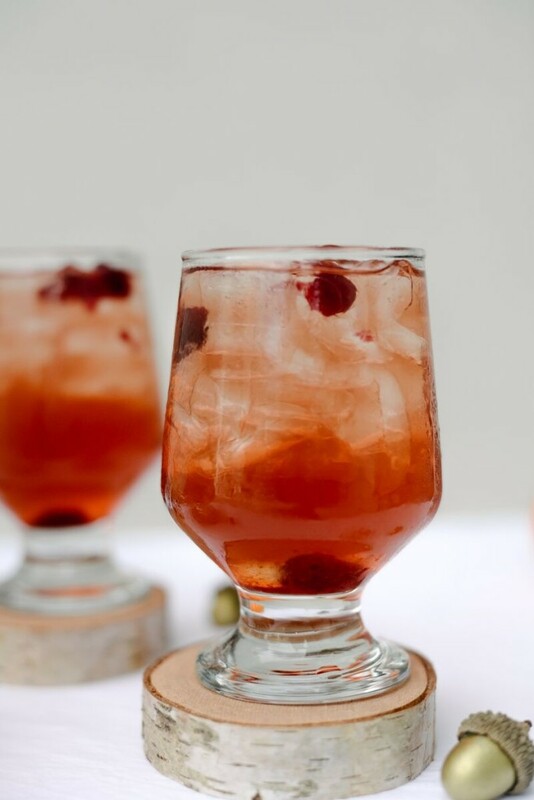 You’ll want to make them for your entire bar collection! This decorative plaque is a unique way to dress up your walls, using a piece of scrap wood and some faux moss. 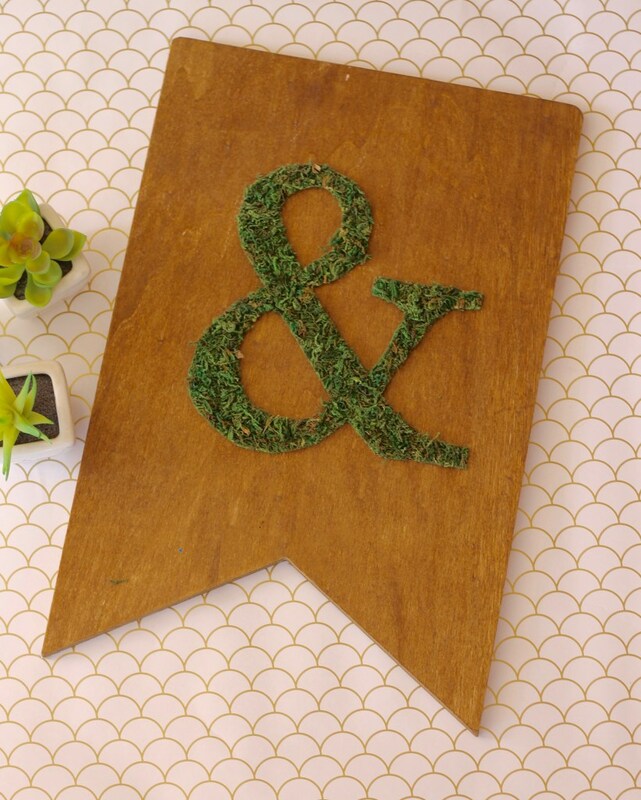 The ampersand looks super stylish here, but you might also consider using your monogram. Head over to The Dean’s List blog to find out exactly how to make one of these lovely pieces yourself. 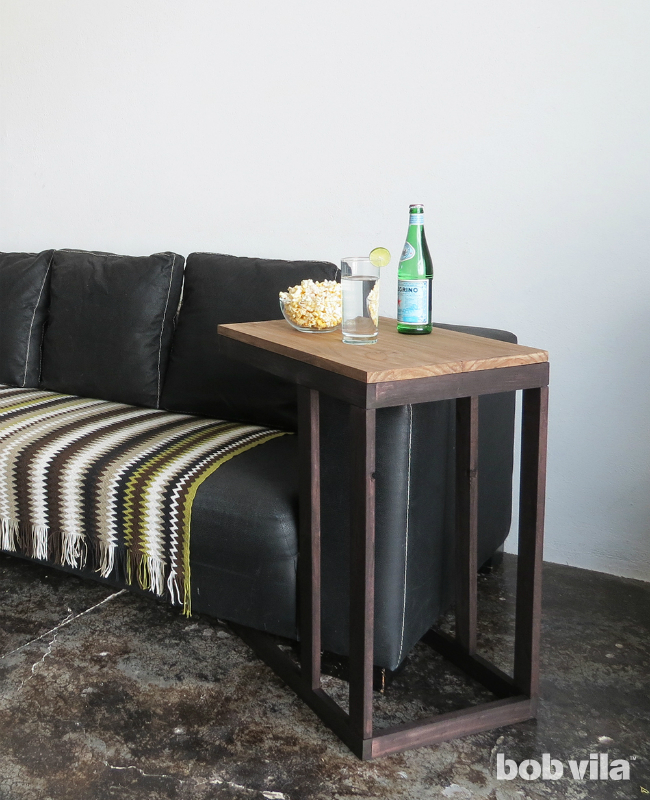 Flex your woodworking skills by creating one of these functional side tables – it can be used like a TV tray, as shown above, and it also works well as a regular end table next to the couch. Make your way over to BobVila.com to check out plans, instructions and photos for this elegant piece. 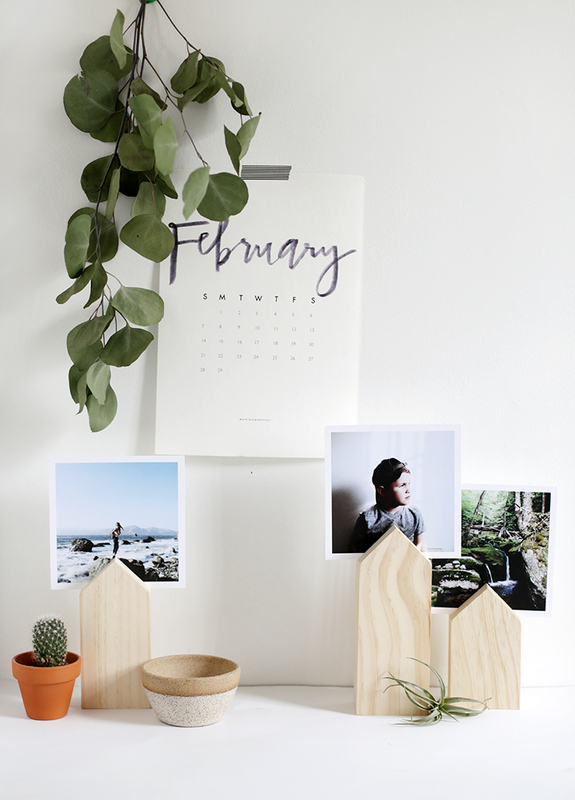 Show off your snapshots in style with these adorable house-shaped wooden photo holders. They are quite simple to make, and they are sure to elicit oohs and ahhs from all of your friends when you tell them you made them. Head over to The Merry Thought to find out how to make one. Get organized with this simple command center designed to help you keep everything right where you need it. 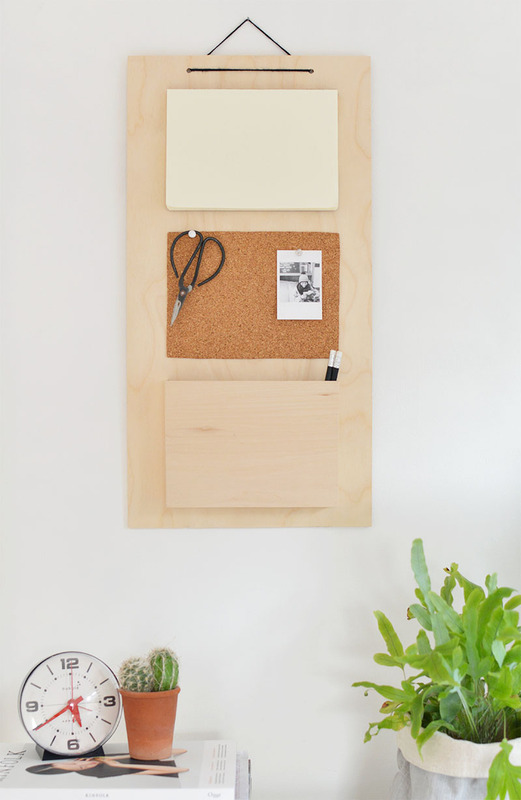 A cork board gives you space to pin photos, and the notebook and pencils provide a spot to jot down notes and lists. Check out the full photo tutorial over at the Burkatron blog. Do you have a handful of favorite books that you like to have handy? 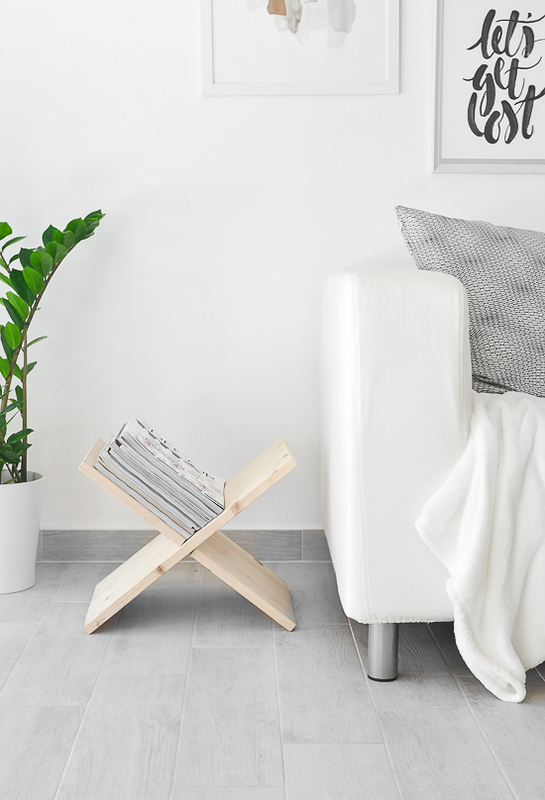 Then this fun wood book stand might be the perfect project for you. The slots are cut at different heights so the tops of the books all line up perfectly. Head over to Home Tree Atlas to find out how to recreate this look for your own books. 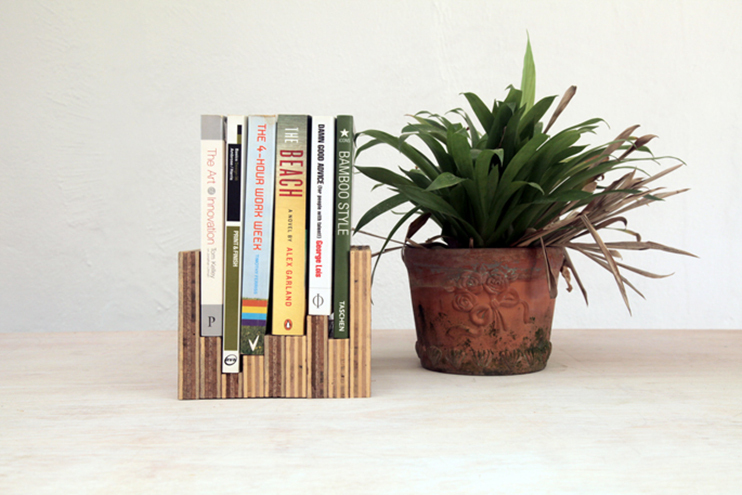 Here’s another book-related DIY – this time, a pair of stylish bookends. 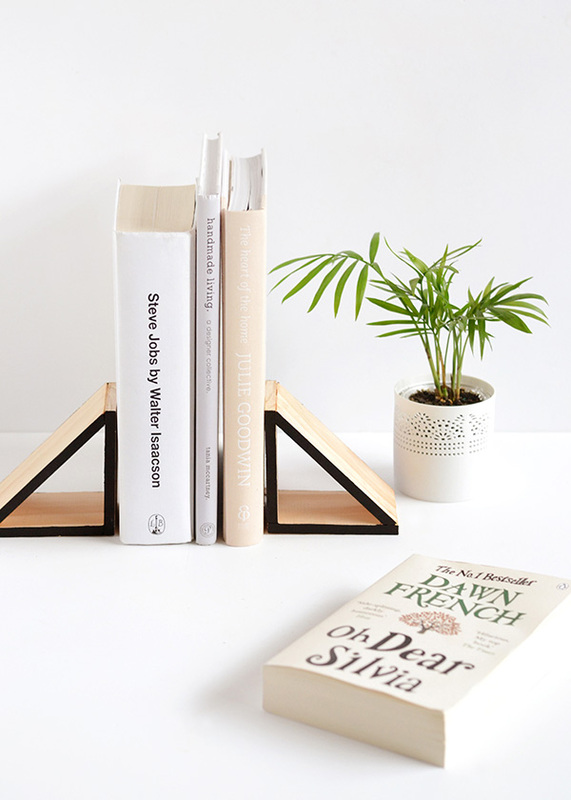 These triangular pieces are both pretty and functional, keeping your books upright without sacrificing any style. Check out the full tutorial along with lots of helpful photos over at Make and Tell. You’ll want to make more than one set! Okay, okay… so these aren’t actually made out of wood. But the faux finish looks quite realistic, and lends a slightly whimsical feel to the notebooks. These are made using adhesive contact paper, making the project super simple. Head over to Burkatron to find out all of the details. 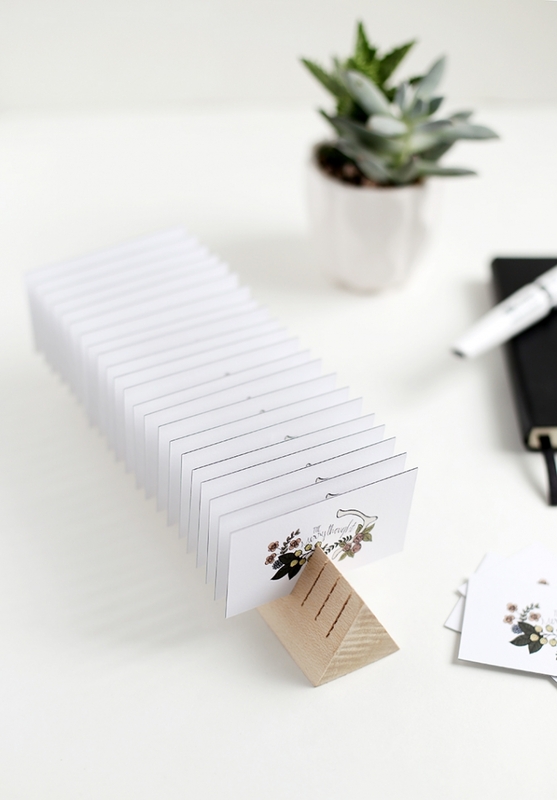 Display your business cards in a unique way by creating this wooden triangular card holder. The key here is to make a series of slits in the triangular piece of wood to make space for the cards to stand up. Head over to The Merry Thought to find out how to make your own. 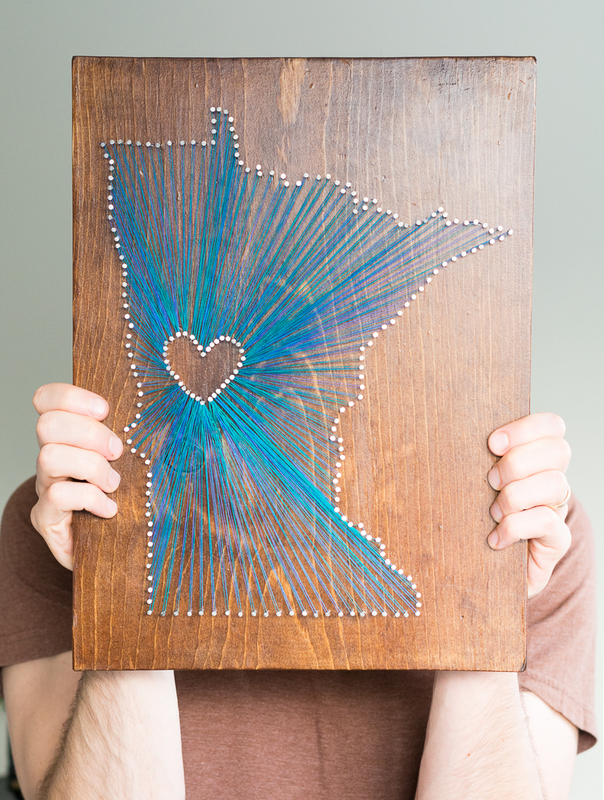 Show your state pride by making one of these cool string art pieces. You’ll need lots of nails, string and a printout in the shape of your home state. Make your way over to By Brittany Goldwyn to find out exactly how to make one of these customized works of art yourself. If you have little ones in the house, you may want to give this fun DIY a try. 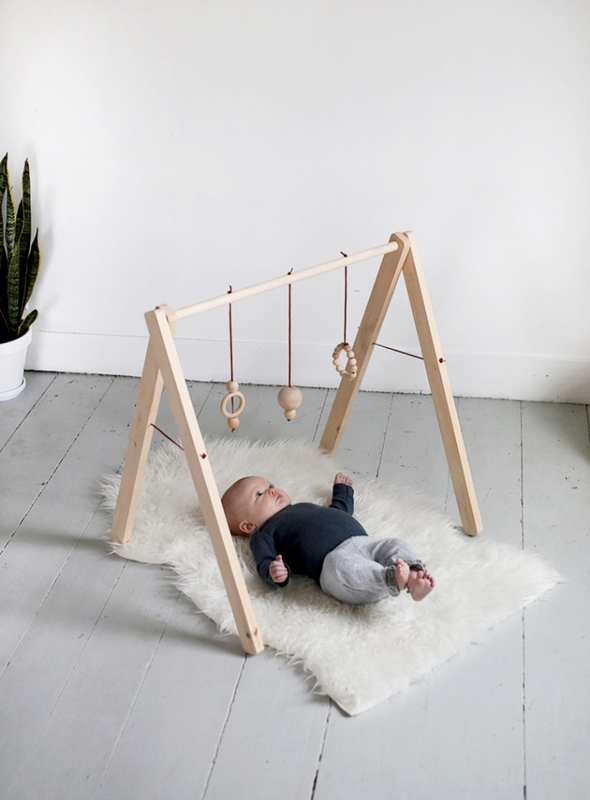 Keep your baby busy with this unique wooden gym that is positioned above and provides hanging wood toys to play with. Head over to The Merry Thought to find out how to make one. 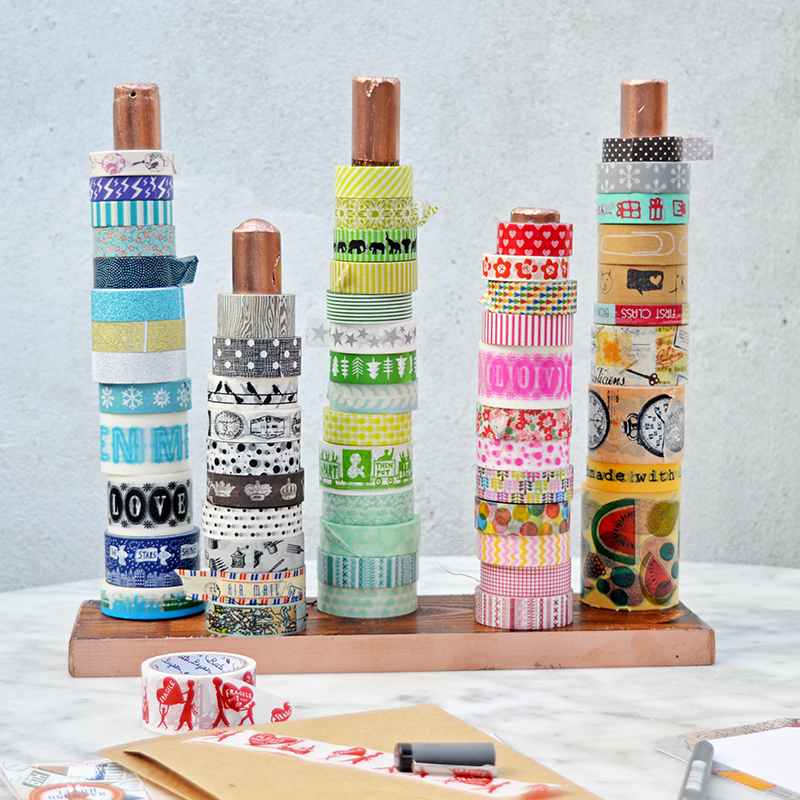 Organize your craft room by making one of these wooden washi tape holders. All you’ll need are a few thick dowel rods and a flat piece of wood for the base. Check out the full tutorial over at Pillar Box Blue to find out all the details. It can be used to store yarn and ribbon too! This wooden beauty dock is a great way to collect and organize your beauty tools, creating a handy spot to keep things like bobby pins, lip gloss and makeup brushes. Make your way over to, once again, The Merry Thought to find out how to make one for yourself. 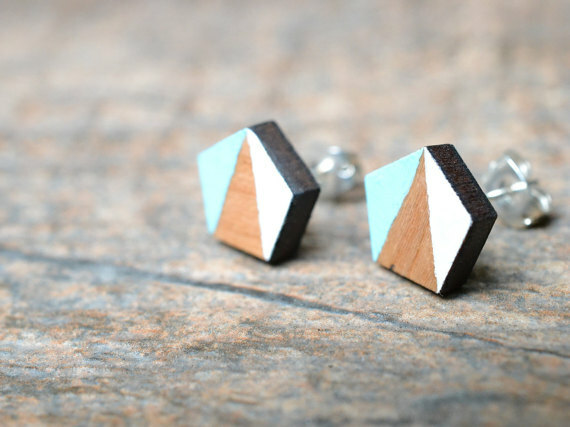 These unique wooden shapes are color blocked with light colored paint, and then glued to earring backs. And the color scheme can be customized to your liking! Head over to Chocolate and Craft to find out how to make your own pair, and to find out where to buy the materials. Add some interest to your wall with these gorgeous candle sconces. 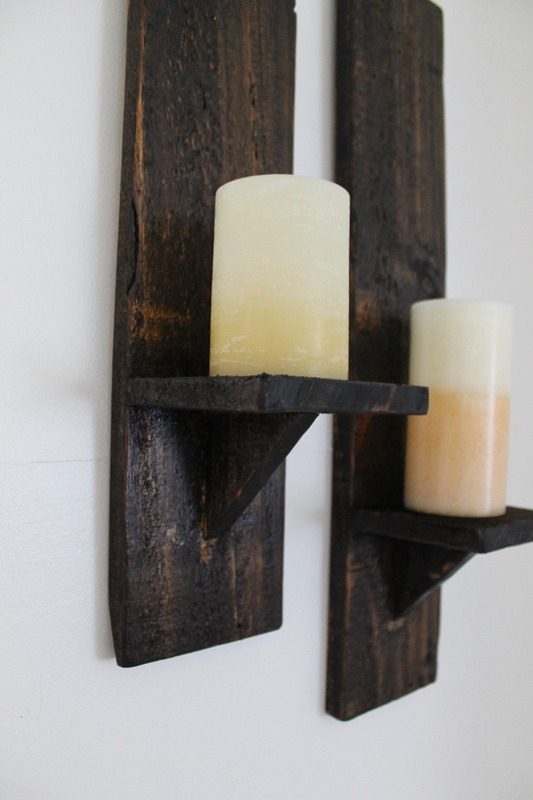 Create a pair of these rustic style sconces out of wood, glue and stain. Make your way over to Amanda Katherine to find out exactly how to create your own set. You’ll want to make them for every room! 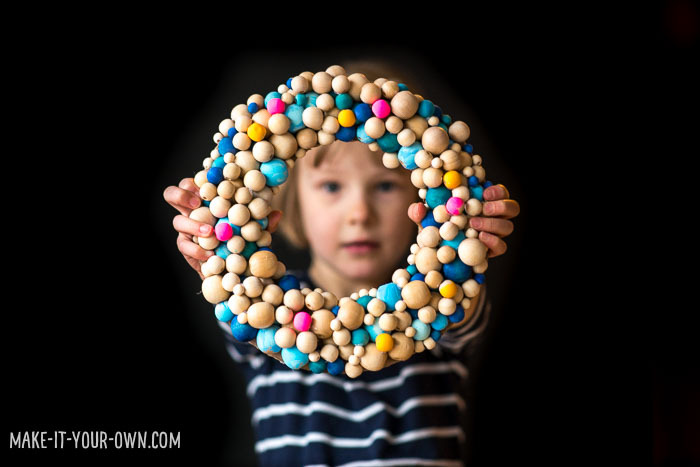 This wreath is made out of lots and lots of wooden beads. It couldn’t be any cuter, with its petite size and sparsely colored beads. Choose your own colors according to your home’s decor. Make your way over to Hello, Wonderful to find out how to make one. This unique calendar is made with a piece of plywood, a rubber stamp with a yearly calendar design, ink, and a few other basic materials. 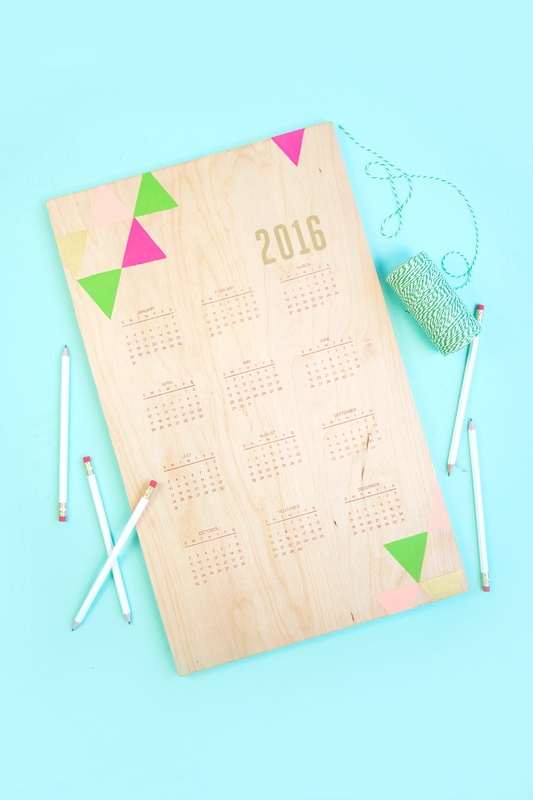 Make your way over to Damask Love to find out how to make your own super stylish plywood yearly calendar. Rather than starting with a slab of wood, this project utilizes lots and lots of popsicle sticks to create a beautiful, contemporary hexagon shaped shelf for your wall. Head over to Make & Do Crew to find out how to stain and assemble this super unique decorative shelf. 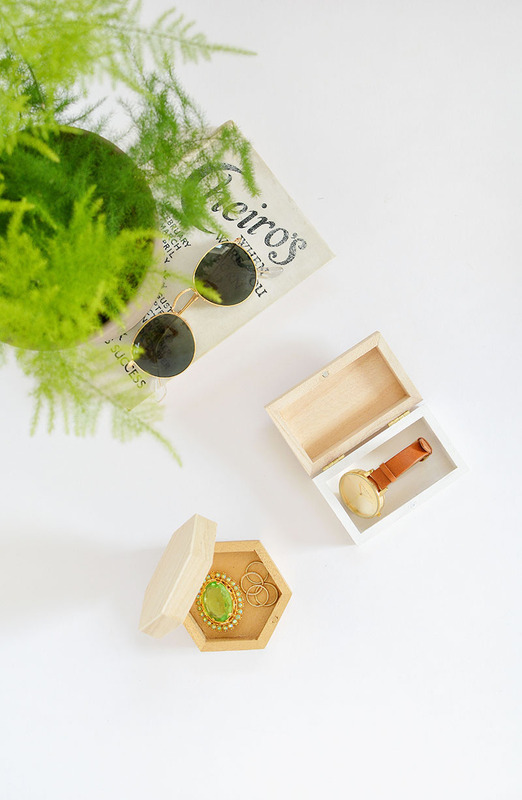 Store loose jewelry and accessories in these stunning two-tone geometric wooden boxes. There’s no woodworking involved with this one, just a bit of spray painting. Make your way over to Burkatron to find out how to to make your own set of two-tone wooden boxes. 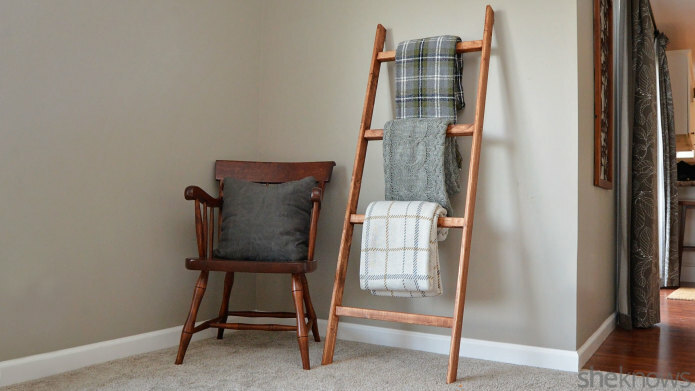 Store your cozy blankets in style by crafting one of these lovely wooden blanket ladders out of some thick squared off wooden dowels. Make your way over to She Knows to find out how to make one yourself. And you might consider painting sections to give it a more colorful look. If you enjoy the look of taxidermy but would prefer it to be artificial, try making one of these unique pieces out of a slab of wood and some painted twigs that look like antlers. Make your way over to Historias De Casa to find out how to make your own faux taxidermy. Slabs of wood also make lovely coasters, as you can see by the image above. These birch wood coasters are finished with a slightly metallic shimmer to give them some serious style. Head over to Let’s Mingle Blog to find out how to make your own set of coasters. Are you in need of some extra space for your clothing? Try making one of these fantastic hanging clothes rails out of a wooden dowel rod and a long leather strip. Make your way over to Burkatron to find out exactly how to create your own fabulous clothes rail. 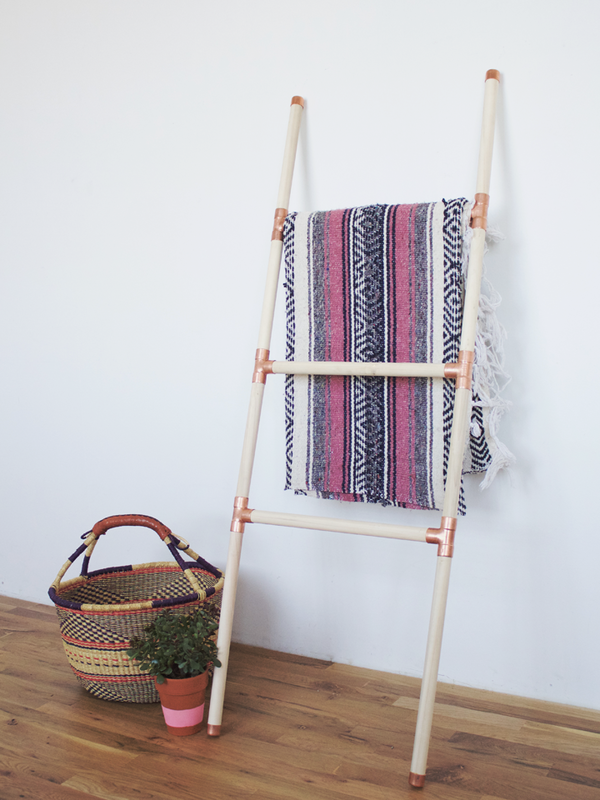 This handy blanket ladder is incredibly chic, with its stylish copper accents which hold the wood dowels together. And it can be customized to the exact size that you need. Make your way over to Foxtail and Moss to find out how to make one of these lovely pieces yourself. 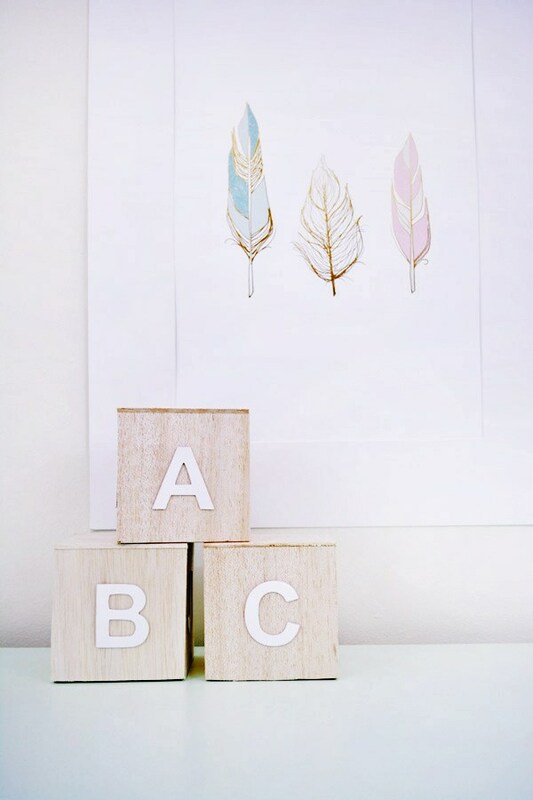 Make a set of these simple wooden alphabet blocks using pre-made cardboard letters and pieces of lightweight balsa wood. You could paint the letters or the blocks (or both) if you like bright color. Head over to BrePurposed to find out how to make your own set. If you love to read magazines as much as I do, you’ll need a good way to display them and keep them organized. 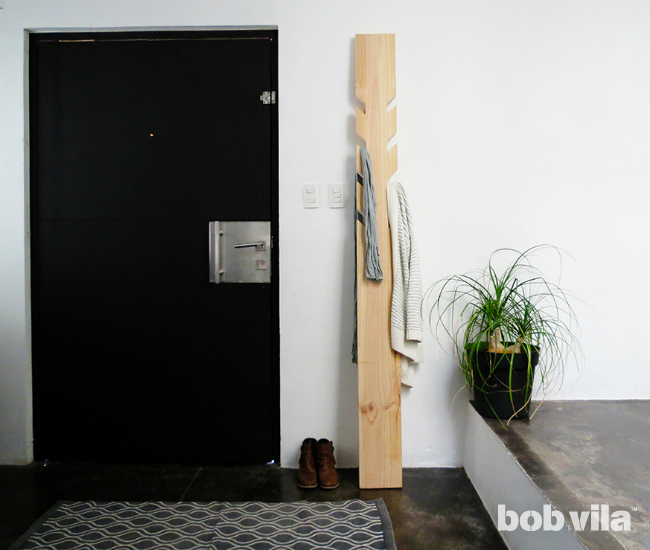 This x-shaped wooden rack will fit the bill, and it is easy to make also. Learn how to make your own rack using the full photo tutorial over at Passion Shake. 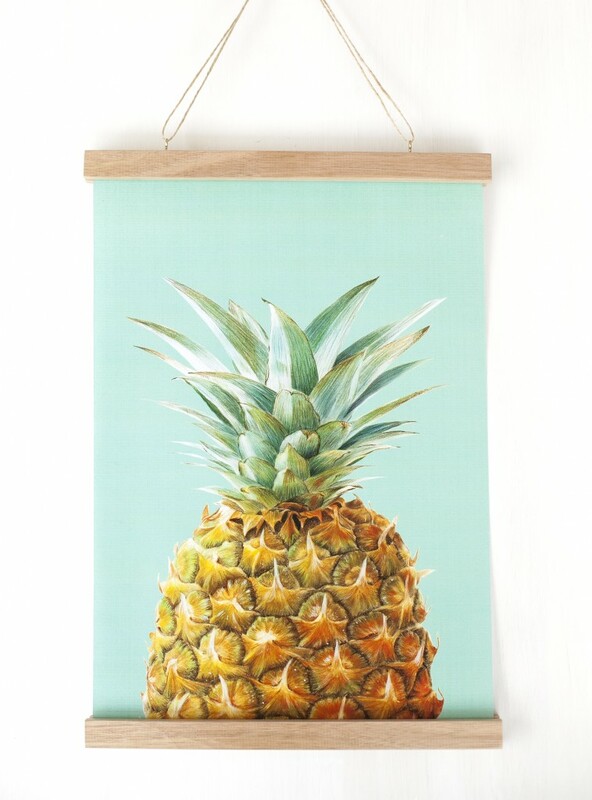 Looking for an easy, affordable way to hang posters and artwork on the wall? This simple DIY wooden poster hanger might be the perfect solution for you. All you’ll need is wood, string and some hardware. Head over to The Crafted Blog to find out exactly how to make your own. 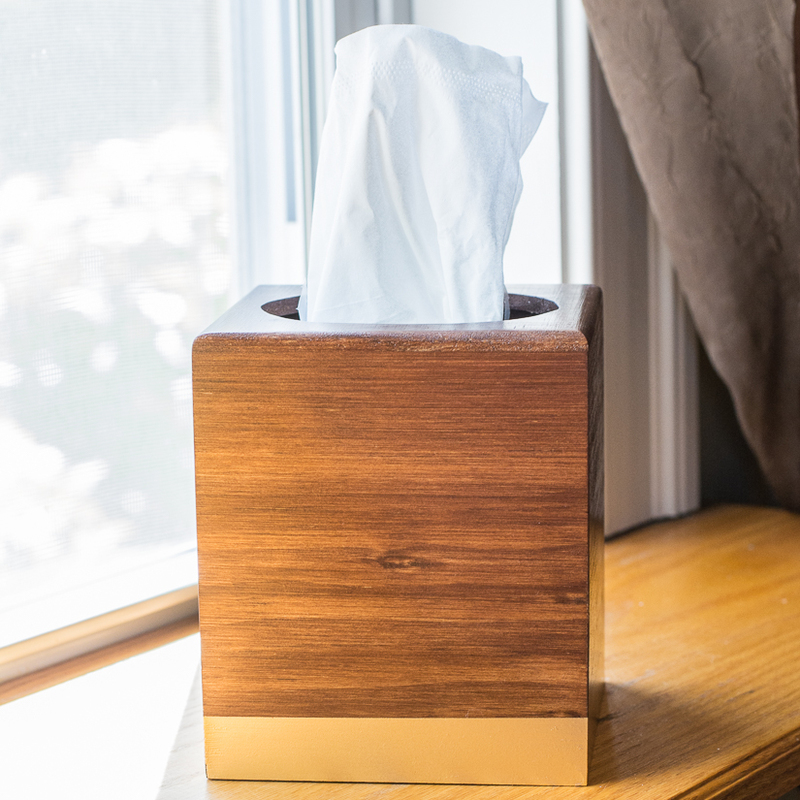 This project is less about woodworking, and more about finishing… you’ll buy a pre-made kleenex holder, and then stain it in your preferred color. Make your way over to By Brittany Goldwyn to find out where to buy the materials and how to stain correctly. Give your space a decorative boost with these super unique DIY wooden tea light holders. 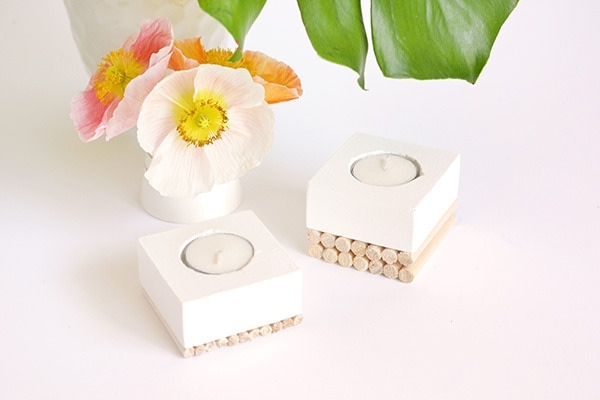 Wooden dowels are layered on top of one another to create a textural base for the block-shaped tea light holder. Head over to Curbly to find out how to make your own set of these candle holders. 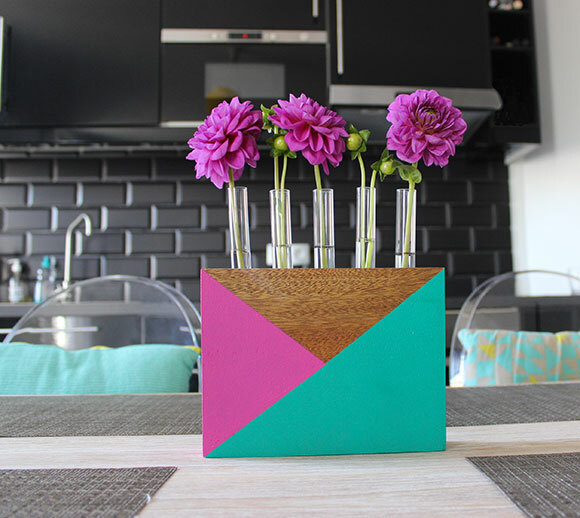 Give your table some serious pizzazz with this colorful wooden test tube vase. You’ll need a high quality block of wood, two paint colors and a handful of glass test tubes from the craft store. Make your way over to I Love DIY to find out how to make one for yourself. 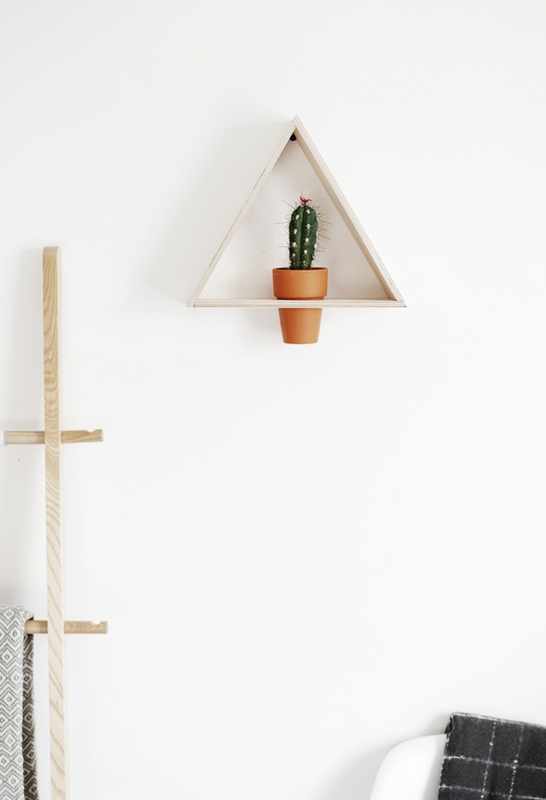 Fill up an empty wall with this classy shelf made out of leather straps and a piece of raw wood. It’s incredibly simple to make, and provides a handy spot to display artwork and knick knacks. 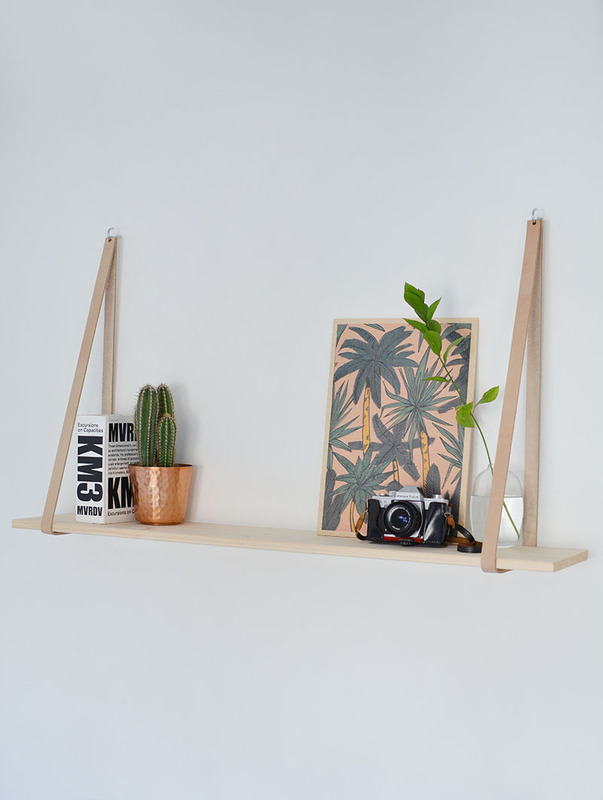 Head over to Burkatron to find out how to create your own wooden shelf. 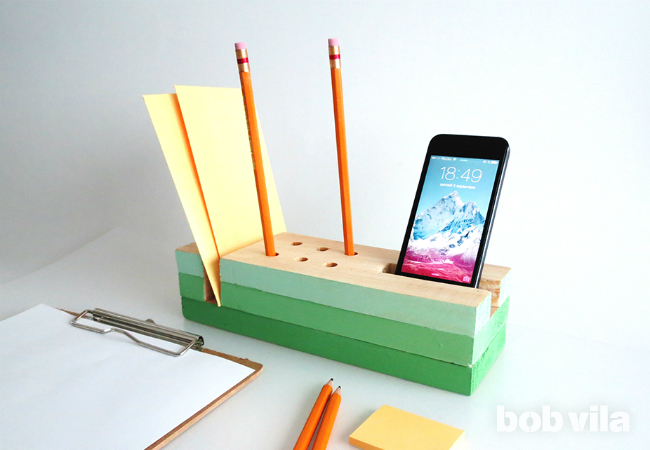 Make your own handy desk organizer to keep track of notes, writing utensils and electronics. 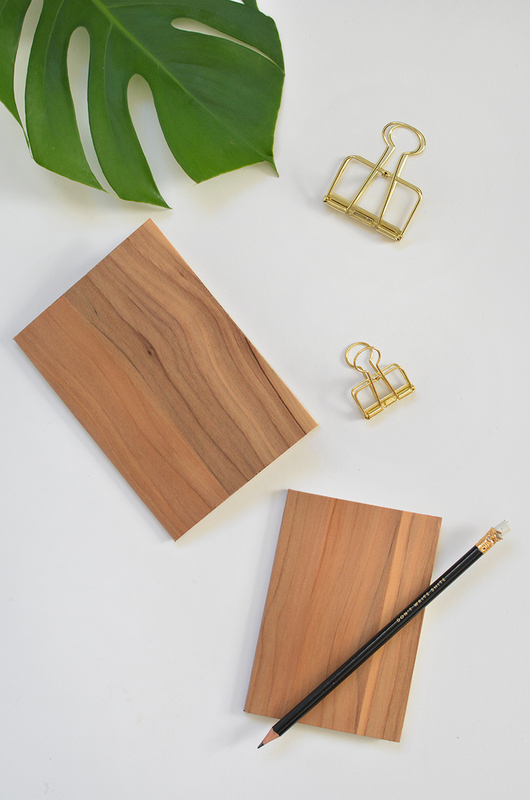 Just grab some wood and paint and head over to BobVila.com to find out how to make one for your desk. And you can customize the size and colors to fit your space. Do your kids love to create artwork for you, but you struggle to find space to display it? 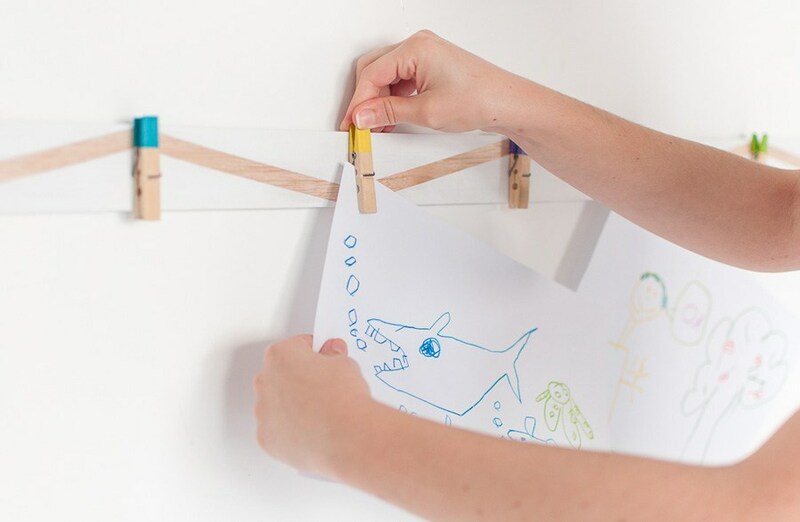 This adorable clothespin display board is the perfect way to show off their drawings and paintings. Make your way over to Historias De Casa to find out how to make one yourself. If you’re a bit of a geek at heart, you might enjoy these fun Tetris-inspired necklaces, bracelets and earrings. 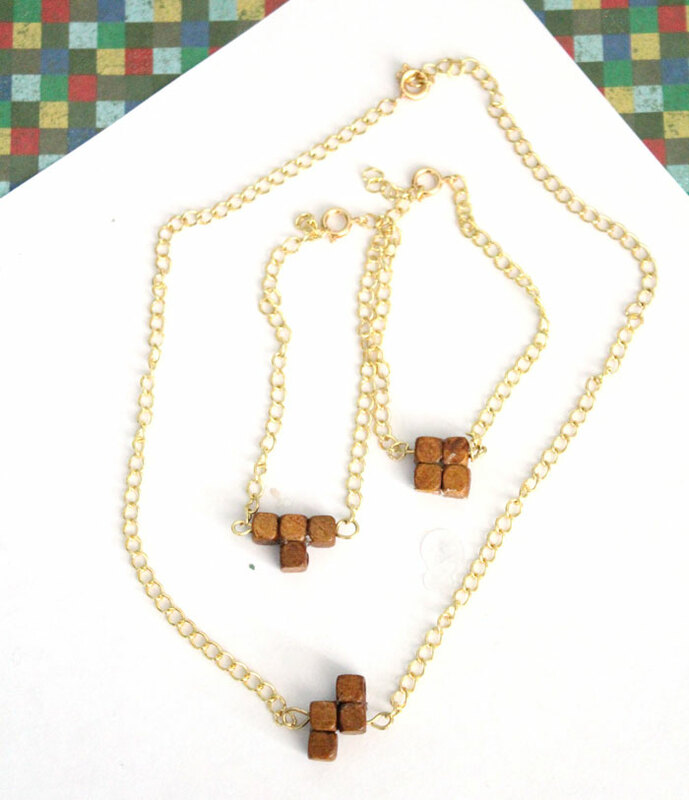 Head over to your local craft store to buy some wood beads and gold chain to get started. Check out the instructions and more photos over at Moms and Crafters. 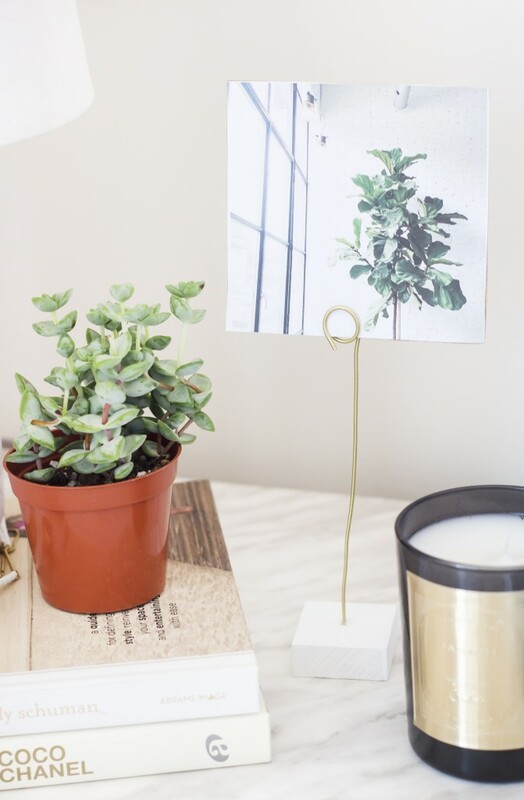 Show off all of your pretty Instagram photos by printing and displaying them with a few of these chic wood and wire displays. Just twist the wire around in a spiral to clip the photo in place. Head over to The Blondielocks to find out exactly how to make one. Dress up a set of plain wooden blocks with a variety of adhesive contact paper with different patterns. If you have kids, they’re sure to love them – or they would make a great baby shower gift, too! Make your way over to Kristi Murphy’s blog to find out how to make them. 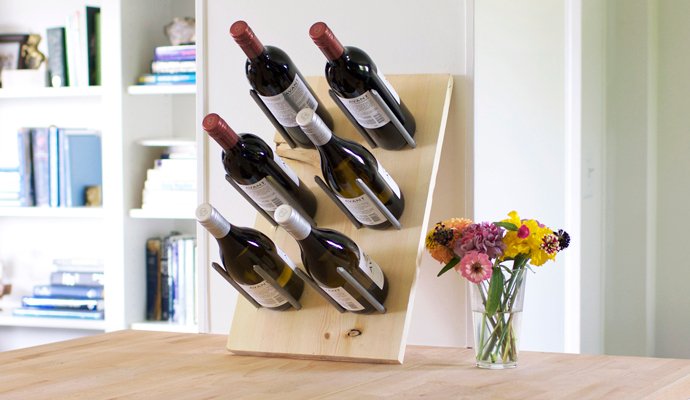 Are you in need of a place to keep your wine bottles organized? This might be just the project for you. All you’ll need is a piece of wood, a drill and a handful of long framer’s nails. 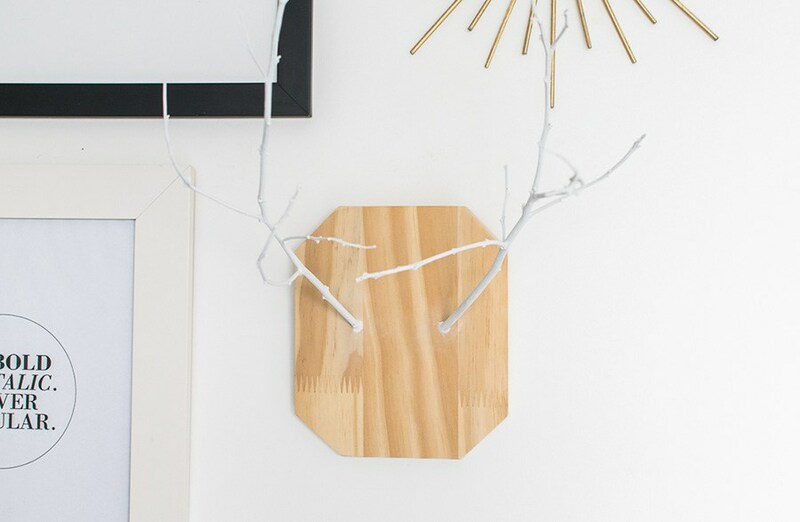 Make your way over to Kendall-Jackson’s blog to find out how to make this rack yourself. 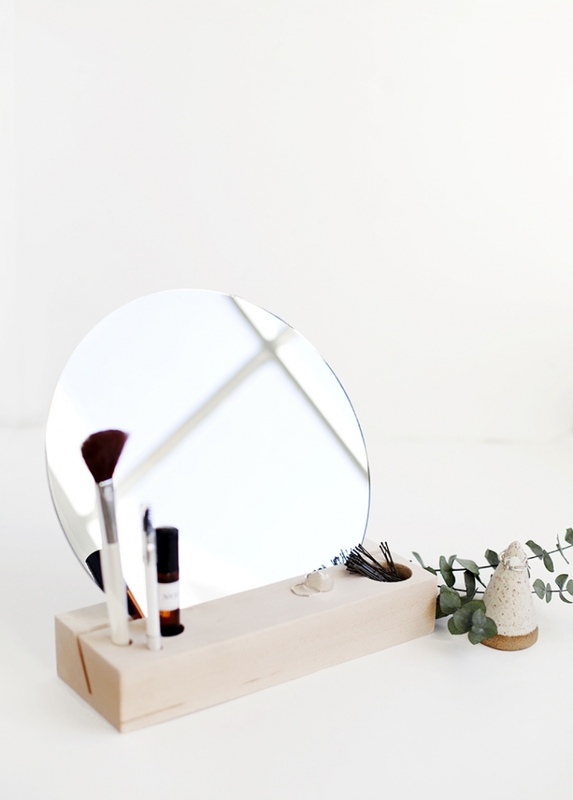 This floor mirror is mounted right to a large piece of plywood, and small shelves are added to one side to create a handy spot to stash accessories and perfume. 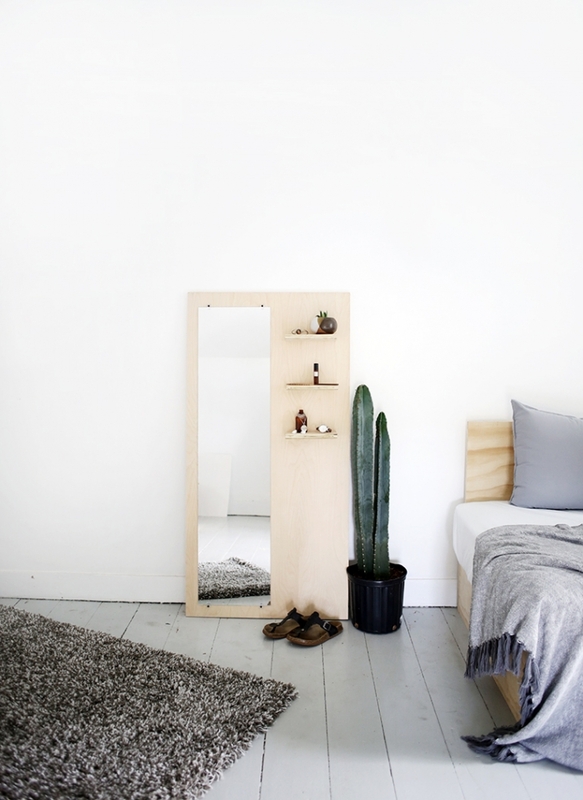 The result is a simple, classy organizer that will add some style to your bedroom. Check out the tutorial here. 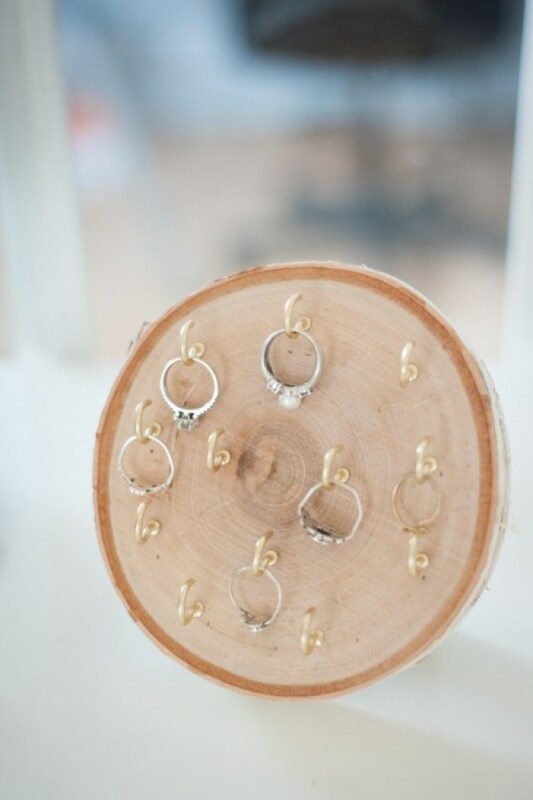 Store all of your rings (or earrings, too) on this gorgeous birch wood ring holder. Just grab a package of brass hooks and a birch slab, and you’ll be well on your way to making this pretty piece. Head over to Dwell Beautiful to find out how to make your own. 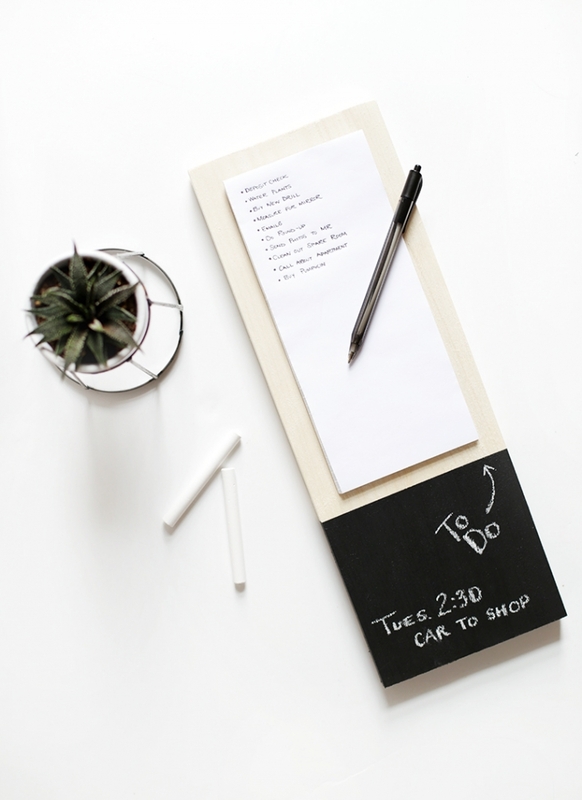 Keep track of your to-do’s and grocery lists by making one of these fun chalk board notepads. It’s a chic way to display your mundane everyday tasks. Make your way over to The Merry Thought to find out how to make a wood notepad of your very own. 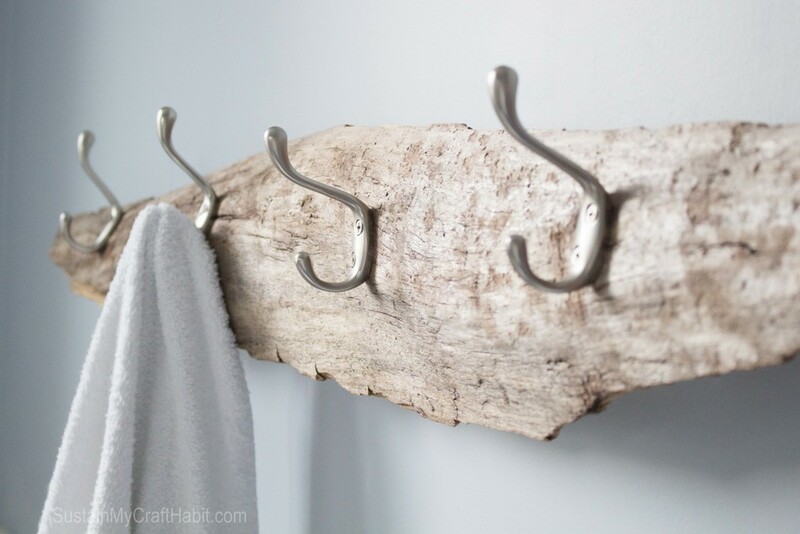 This driftwood towel rack would be perfect for a beach lover’s home, and all it requires is a found piece of wood and some simple hooks making it a super affordable project. 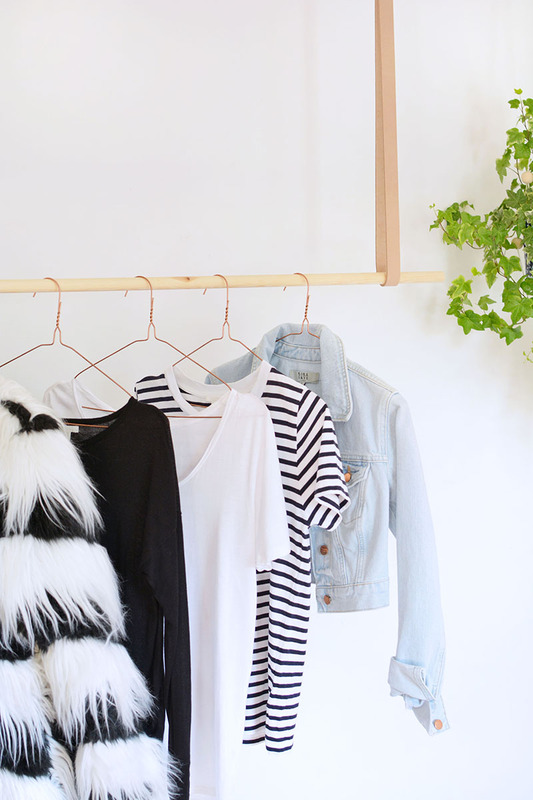 Head over to Sustain My Craft Habit to find out how to make one of these racks yourself. 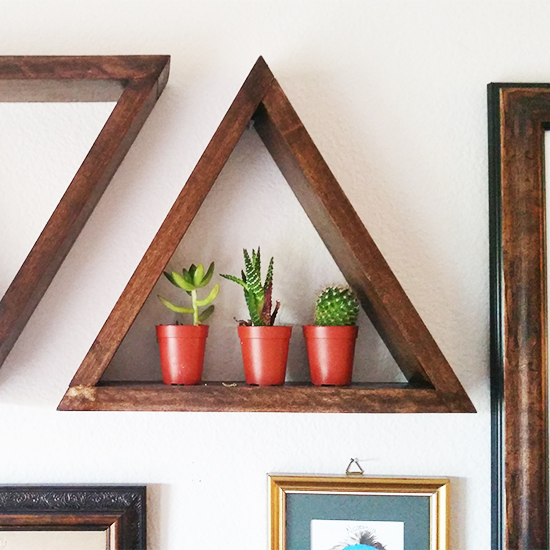 This lovely, rustic triangular shelf makes for a unique wall decoration, and looks even better as a set of two or three. Just grab some wood, stain and a saw and you’ll be ready to go. Make your way over to Well Made Heart to find out how to make this piece. 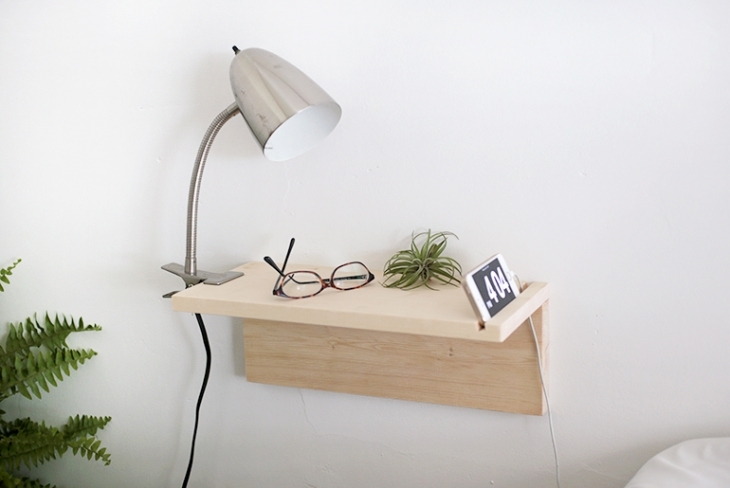 This floating wood shelf would be perfect for any small space, since it doesn’t utilize any floor space and very little wall space. It’s the perfect amount of surface area for a book, a glass of water and your phone (of course). Check out the full tutorial over at The Merry Thought.